California property owners who are looking for a company that offers the best value-for-money tree planting services should contact us today. Design West Landscaping provides comprehensive tree installation offerings that range from mere planting trees to caring for them. So, if you like the idea of hiring a company that is virtually a one-stop shop for all your landscaping needs, then don't hesitate to call us today or visit our office. We service Lodi, Stockton, Dublin, Elk Grove, San Ramon, Livermore and neighboring cities in California. Call Us NOW for an Estimate (209) 327-9661, Or Click here to Contact Us. Tree planting is a job that is best left to people with decades worth of experience doing the job. Homeowners and commercial landscape owners run the risk of having the wrong tree species if they hire a fly-by-night landscaping company. A certified horticulturist can pick the right tree species that will grow well in your specific location, as well as plant them the right way. As it is, incorrectly planted trees may wither and die or not grow very well, despite your best efforts to nourish them. Tree installation also requires using the right tools and equipment so the job can be completed quickly and with guaranteed positive outcomes. We have a ready source of healthy trees and any type of tree that our clients may require. We have long-time partner suppliers who have some of the finest trees that thrive well in California. Such species include autumn blaze maple, Thuja emerald, Cleveland pear, Forsythia, American sycamore, white dogwood, hybrid poplar, royal empress, and many other species. Our people know the proper way of installing trees. They follow a step-by-step and industry-approved way of planting trees that will guarantee their survival and health. Having worked on numerous tree planting jobs before, our people have mastered the techniques that ensure successful planting of various California tree species. 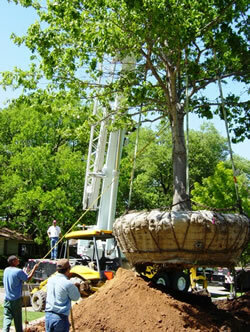 We have the right tools and equipment needed to install or plant trees. These tree planting tools allow us to do our tree planting service efficiently and to complete our jobs the soonest possible time. Our people can also ensure that your trees will thrive or survive after planting. We use scientific methods or techniques for planting your chosen tree species. This is vital since some are not seedlings but already half-mature trees. With all the benefits that clients will get in our comprehensive tree services, it is not surprising why most California landscape owners choose Design West Landscaping. 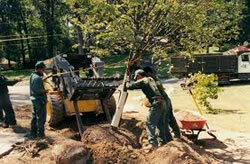 If you also want to have an experienced landscaping contractor to work on your tree needs, call us. You could also visit our office during business hours so we can personally answer your tree installation concerns.